Congress is back to trying to repeal Obamacare, and this newest bill could transform health care. It’s next week or never, so what do you need to know? Will it pass the Kimmel test? “This guy, Bill Cassidy, just lied right to my face”. That was Jimmy Kimmel, last Tuesday night, addressing a monologue to his audience about health care policy. He was talking about a Congressman from Louisiana who, along with three other Republicans, is pushing a bill that would dismantle the Affordable Care Act, or “Obamacare”. Specifically, the bill will tear up protections for people with preexisting conditions, cause higher premiums, and “kick about 30 million Americans off insurance,” Kimmel said. Would a child born with congenital heart disease be able to get everything she or he would need … all the services, even if they go over a certain amount? And yet, Kimmel claimed, astounded, this politician was pushing for a bill that is bound to allow insurers in many states to “jack up the rates” for people with preexisting conditions, and impose the very annual or lifetime caps that Cassidy ruled out in his “Jimmy Kimmel test”. Meaning that, if you get ill enough for long enough and your medical care costs more than a certain amount of money, they stop paying out and you’re on your own, unable to afford the operations you need. The Republican sponsors of the bill are in a hurry to pass this bill too. On September 30, so-called “reconciliation” rules that prevent the Democrats from filibustering an Obamacare repeal bill like this will expire. After that they would need more than 51 votes in the Senate and it becomes much harder, probably impossible, to repeal the ACA. That’s why they’re rushing ahead even though nobody knows exactly what its impact might involve, because the Congressional Budget Office (CBO) hasn’t had the opportunity to calculate it yet. It will offer some rough estimates early next week, but providing a proper assessment of the consequences for insurance coverage and premiums would take “at least several weeks”, the CBO announced. Republican politicians are intent on trying to pass the law without knowing those numbers. If nothing else, though, this might be the obstacle they fail on. Today, John McCain declared that he could not support the bill “without knowing how much it will cost, how it will effect insurance premiums, and how many people will be helped or hurt by it”. Of course, at NurseRecruiter.com, we are most interested in what nurses and other health care professionals say. If this legislation becomes law, we will see a greater shift of care from clinics to emergency rooms … When you take away health insurance, people are unable to get necessary preventative care, and as a result, they end up in the hospital with urgent situations … increasing the overall cost for care. The American Nurses Association (ANA) already spoke out over a week ago, when it didn’t look like the bill had much of a chance. “We keep seeing the same proposals over and over again,” the ANA wrote wearily. This bill “is not substantially different from any of the other repeal and replace bills we have seen”. Later, the ANA’s Matthew Fitting wrote that this is “the worst healthcare bill yet”. Peggy Chinn, the nursing professor and advocate who edits Advances in Nursing Science and blogs at Nurse Educator Praxis, was one of the RNs who took to Twitter to call for action: “Call your members of Congress now”. Jimmy Kimmel got pretty specific in his seven-minute monologue. A lot more specific than TV hosts normally do, that’s for sure! “It felt more like C-SPAN than late-night TV,” a CNN pundit observed. Lindsey Graham, one of the Republican co-sponsors of the bill, was livid that Kimmel “went on national TV and called this man, who has worked for the underprivileged and health care all of his life, a liar”. Cassidy himself replied too, saying “I’m sorry he does not understand,” and insisting that more people will have coverage under his bill and individuals with pre-existing conditions will remain protected. That set off Kimmel again, who got into the issue all over again in his show on Wednesday. But was Kimmel right? It sure seems so. “Kimmel, not Cassidy, is right on health care,” health care analysts told Politico. Cassidy’s response to Kimmel’s critique was “mostly false”, according to PolitiFact. A Washington Post analysis concluded that “it turns out Kimmel understands the bill’s impact better than its authors do”. The bill by Senators Graham, Cassidy, Heller and Johnson would do away with Obamacare’s mandate that obliges people to have insurance or pay a fine. But just as importantly, it would replace federal funding from Obamacare into a block grant for states to spend on health care. An NPR report that provides a detailed comparison of the ACA and the Graham-Cassidy plan sums up what would all go. The bill reverts “the Obamacare Medicaid expansion that was adopted by 31 states”, which made it possible for significantly more lower-income people to get on Medicaid. It gets rid of the subsidies that helped many other middle-class people buy insurance on the ACA markets. It does away with the reimbursements insurance companies are supposed to get under the ACA “for offering price breaks on copayments and deductibles to the lowest-income customers”. Instead, starting in 2020, states would get a fixed amount of funding. It would then be up to state governments whether they want to use that for expanding health insurance coverage, or limit the number of people who qualify for help and spend the money on other things instead. We should trust them, Cassidy insists, to “find solutions that will work better” for them than the ACA. Even if states do decide they want to keep everyone who got insurance under the ACA covered, however, they would have less funding to do it with, the Washington Post explained. The bill would cut the amount of federal funding that’s now supplied through Obamacare by a third between 2020 and 2026. That’s hundreds of billions of dollars less, in total. The amount of Obamacare subsidies and Medicaid funding increases the more people get insurance, but the funding rate provided by this bill as block grants would remain fixed. That means “tough trade-offs”, as even a professor at the Hoover Institution who is optimistic about the bill’s general impact acknowledged to Politico. It would force “states to choose whether to cut Medicaid enrollment, benefits or payments to providers — or else raise taxes”. When it comes to premiums, there’s a similar question. “Under this bill, states could theoretically invest their own money to lower premiums,” but since that would mean cutting other spending or raising taxes, it’s not necessarily likely, the Post argues. Abolishing the mandate that forces people to buy insurance or pay a penalty also means many healthier people will drop theirs, and the insurance companies will respond by raising the premiums of those who stay in. So Kimmel is right when he says that the bill itself doesn’t provide “lower premiums for middle-class families”. The bill would increase the amount of money people can put tax-free into a health savings account, though. Along with another tax-related measure, this would benefit wealthy people especially, NPR explained. On top of all of this, even the block grants themselves would be eliminated entirely in 2027. That sets up the states for a huge drop in health care funding. Would they be replaced? That depends on the politicians of 2027. Would millions lose their health insurance? The bills which Congress tried, and failed, to pass earlier this year to repeal Obamacare would have left 21-24 million people fewer insured over the next ten years than if the ACA stays in place, the CBO calculated. 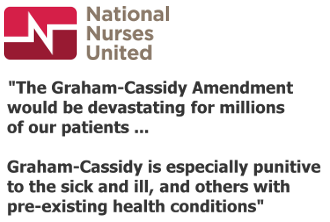 If anything, it looks like the Cassidy/Graham bill could be even worse. Right now, the ACA’s marketplace subsidies and Medicaid expansion cover about 30 million people. That would all be put at risk under this new bill, the Commonwealth Fund’s Sara Collins writes. Ultimately, if the block grants are not replaced when they expire in 2026, it could lead “to a loss of health insurance for at least 32 million people”. It doesn’t help that the legislation “would eliminate Obamacare’s penalties for employers that decline to offer their workers affordable coverage”, as the New York Times reported. Some 15-18 million people could become uninsured in the first year under the new rules alone, voluntarily or involuntarily. That’s not all though. An analysis by the Center for Budget and Policy Priorities (CBPP) also mentions the 32 million number. But it adds something Kimmel didn’t even touch on: more Medicaid cuts. It’s not just the federal funding for the Medicaid expansions under Obamacare that would be cut. The bill would radically restructure and cut “the entire Medicaid program”, the CBPP claims, capping federal Medicaid funding “for seniors, people with disabilities, and families with children” instead of allowing it to grow along with needs. Medicaid spending for children, for example, would drop by almost 15% in ten years, according to an assessment by Avalere Health. Collins calls it “the deepest cuts in the Medicaid program since its inception in 1965”. “Fact,” Jimmy Kimmel said: the Graham-Cassidy bill “will kick about 30 million Americans off insurance”. That’s not sure. But it’s certainly possible. Pre-existing conditions: back to square one? What about Kimmel’s claim that the bill doesn’t protect against “discrimination based on preexisting conditions”? The Cassidy-Graham bill would leave it up to the states whether they want to keep protections for people with pre-existing conditions in place, at least after the first two years. If they want, they can give insurers the right to charge those people more. The CBO already determined that many states would do so, the Post pointed out. Those states would still have to say they want people with preexisting conditions to have access to health insurance, but they wouldn’t need to prove anymore that their legislation ensures it. Since the bill gets rid of most federal Obamacare protections, it no longer guarantees that insurers will be banned from imposing annual or lifetime caps either. No guarantee of a “Jimmy Kimmel rule”: it will likely depend on the state you live in. It’s not just pre-existing conditions. Under the bill, states could also waive the obligation for insurers “to cover essential health benefits”, the CBPP points out. That includes treatment for mental health and substance abuse, but also for pregnant women. These kind of waivers could eventually lead to lower premiums for people who don’t need those essential health benefits and don’t have pre-existing conditions, the Avalere Health analysis suggests. But the people who do? They will pay all the more. This is a point you will see come up over and again. Under the Cassidy/Graham bill, your health insurance options would come to depend a lot more on the state you happen to live in, depending on how the state government there ends up regulating the market, and how it spends its block grant. This principle will appeal to states’ rights activists, but there’s a flip side. Where most Obamacare funding is determined by how many individuals qualify and sign up for insurance, here it’s the federal government that sets the amount of funding each state gets as block grant. Avalere Health has already calculated how that works out under the bill. Sixteen states (fifteen of which voted for Trump in the presidential election) would get more funding than now. The other 34 would get less. Especially states that have expanded Medicaid and helped many new people with modest incomes enroll in health insurance under the ACA would see heavy cuts, compared to what they would receive under current law. States with many poor residents would be more likely to gain, but “differences in the price of medical care in different regions” are glossed over. In dollar terms, California would lose the most; Texas would gain the most. In relative terms, Oregon would for example see as much as 20% less federal funding over the next ten years. The cuts would be a lot steeper still, and affect all fifty states, if the block grants are not replaced in 2027 when they expire. State governments will face a hefty practical challenge as well. They have to come up with whole new systems “to phase Obamacare out to something that replaces it,” industry consultant Robert Laszewski told the NY Times, and they’ve “only got two years to figure all of this out”. It’s no wonder that a group of Republican, Democratic and independent Governors has come out against the bill. Governors Baker (Massachusetts), Bullock (Montana), Edwards (Louisiana), Hickenlooper (Colorado), Kasich (Ohio), McAuliffe (Virginia), Sandoval (Nevada), Scott (Vermont), Walker (Alaska) and Wolf (Pennsylvania) urged the Senate to instead support efforts that had started to create a bipartisan bill to fix the problems of the ACA. So in short: fewer people getting Medicaid, and less spending on Medicaid, than under current law; no federal subsidies to help middle class families purchase health insurance; block grants for states that state governments might, or might not, use to keep the same number of people insured and premiums in check; less funding overall for health insurance coverage than under current law in 34 of the country’s 50 states; and the prospect of insurers in many states being once again allowed to impose annual or lifetime caps, refuse covering essential health benefits, and charge higher premiums on people with pre-existing conditions. Kimmel did not overstate the impact … If Graham-Cassidy becomes law, there is no guarantee a child born with a congenital heart defect will get the coverage they need. It would depend on where they live, but even states with good intentions would struggle to protect children with the massive cuts to Medicaid included in this bill. Do you want to know more — much more? The Kaiser Family Foundation has published an exhaustive comparison of current law and the Graham-Cassidy bill, subject by subject. And if you really want to get into the legalese, you can read the actual bill here. This bill would limit funding for the Medicaid program, roll back important essential health benefit protections, and potentially open the door to annual and lifetime caps on coverage, endangering access to critical care for millions of Americans. The American Health Care Association is most aghast about the “catastrophic” Medicaid cuts, “slashing hundreds of billions of dollars … that funds essential care for the aged and disabled”. They will threaten the access of vulnerable seniors and individuals with disabilities “to home and community-based services, such as assisted living care”. The Consortium for Citizens with Disabilities agrees: “we cannot overstate the danger facing the millions of adults and children with disabilities if the proposal’s Medicaid provisions are adopted”. 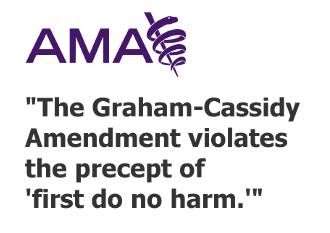 The Graham-Cassidy bill “violates the precept of “first do no harm”’, the American Medical Association declared. The organization of physicians and medical students warned that the bill “would result in millions of Americans losing their health insurance coverage … and decrease access to affordable coverage and care”. Again, it’s not just the parts of the bill that repeal the ACA, and especially the waivers that allow insurers to “charge unaffordable premiums” to people with pre-existing conditions and leave “essential health benefits” uncovered, that worry the physicians. It’s the overhaul of Medicaid itself that caps the program’s spending per person. These “per-capita-caps fail to take into account unanticipated costs of new medical innovations or the fiscal impact of public health epidemics, such as the crisis of opioid abuse currently ravaging our nation”. Six other physician groups, including the American Academy of Pediatrics and the American Psychiatric Association (APA), wrote a joint letter of protest too. “We should be celebrating” how many fewer Americans go without health insurance now than a few years ago, they argue, “not pursuing legislation that would drive up the number of uninsured”. In its own letter, the APA warns that “this bill harms our most vulnerable patients,” including the millions of Americans “with serious mental illness [or] substance use disorders”. The Association of American Medical Colleges, which represents all 147 accredited medical schools in the U.S., warned that the bill “will almost surely lead to dramatic increases in the number of uninsured patients nationwide and put important existing patient protections at risk”. It’s irresponsible for Congress to try rushing through “a complete overhaul of the health care system” without even a review by the CBO. At least five organizations of hospitals have issued stern warnings about the bill, from the American Hospital Association to the Catholic Health Association. 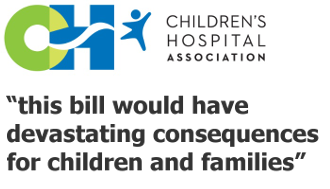 The Children’s Hospital Association declared that “this bill would have devastating consequences for children and families”, slashing funding for Medicaid by one-third and weakening important consumer safeguards. “Millions of children in working families would no longer be assured that their private insurance covers the most basic of services without annual and lifetime limits and regardless of any underlying medical condition”. You’re a nurse. What can you do? Health care is complicated. It’s boring. … The details are confusing, and that’s what these guys are relying on. They’re counting on you to be so overwhelmed with all the information you just trust them to take care of you, but they’re not taking care of you. … And we’re all just looking at our Instagram accounts and liking things while they’re voting on whether people can afford to keep their children alive or not. If you’re a nurse, you won’t be thinking health care is boring! But it’s true that the amount of information is pretty overwhelming. We were a little overwhelmed just writing up this post. It’s hard to cut through all the claims and counterclaims and not just sink back and give up. But as a nurse, we’re pretty sure you feel strongly about this one. You might even disagree completely with our write-up and think this bill is great. We all know the ACA is imperfect. But the important question now is: would this law be better? Whatever you think: let your Senator know. Your Representative in the House too, because they would be the next to vote on this, if it passes in the Senate. There will be a lot of stories in the media about the latest thing Rand Paul, John McCain, Lisa Murkowski or Susan Collins has said about how they will, or will not, vote. But until the end of next week, nothing is sure yet! Here’s the contact info for all US Senators. Find your U.S. Representative here. Calling is much more effective than emailing or writing letters, let alone leaving them Facebook posts. Make sure to inform them you’re a voter in their state/district. Be brief and polite, and follow these tips. Tell them you know about the Cassidy-Graham-Heller-Johnson bill, and let them know: you’re a nurse, you have real-life expertise with health care. Call them!